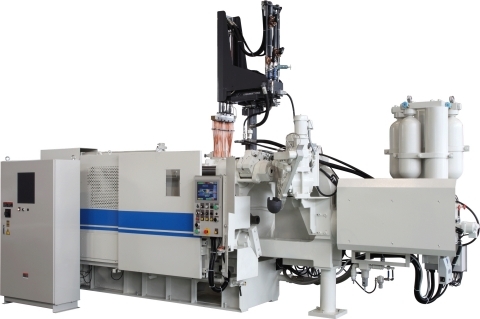 Toshiba Machine Co., Ltd. (TOKYO:6104) has developed the new DC-KT Series Die Casting Machines to meet the needs of the Southeast Asian market and has started sales and production at its plant in Thailand. The Thai plant has been engaged in the manufacture and sales of die casting machines for four years. The knowledge gained about local market needs over this period led to the development of these new die casting machines with features not found in previous machines, namely, a preset function for casting pressure, 2-level injection settings for low speed, and intensification accumulator in standard configurations. Also, the machine control panel incorporates a touch panel for intuitive, simple operation and control. The product lineup includes 280-ton and 400-ton models providing even higher die-locking force than previous models for enabling support for casting of larger products. Improved high-speed acceleration performance and maximum injection force allow casting of complex-shaped products, products with large thicknesses, and a wide array of other product types. Production and shipping at the Thai plant near the market enables faster delivery times, more stable production, and quicker response to customer requests for modifications, overhauls, and other services. Company president Tanabe of Toshiba Machine (Thailand) Co., Ltd, expressed his intention to expand in the Southeast Asian market; "We want to aggressively expand sales using this new model, which was developed based on feedback from our customers in the Southeast Asian market." Toshiba Machine will launch these new die casting machines to assist Southeast Asia region customers in attaining even higher productivity. Toshiba Machine (Thailand) Co., Ltd.